Nowadays everything is secure with passwords, including websites emails and everything. But it is not easy to deal with all those information. There are just a lot of numbers and alphabets that you need to remember. 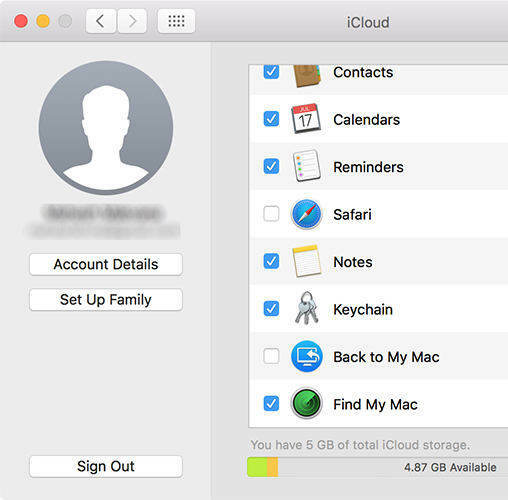 iCloud Keychain is capable of storing various passwords and log-in information that will be provided to you when you need them. The best thing is that you won't need to remember all those details anymore; iCloud Keychain will automatically sort it out for you. But there are users who prefer privacy more than convenience, and as it is a built-in feature they fear that iCloud Keychain will backup them up automatically even if they don't want to. Actually, that is not the case, you can disable Keychain if you want to and it won't backup any of your personal information. The article below discusses the iCloud Keychain deactivation procedure on both iOS and Mac devices, read them carefully. Step 1: Open your iOS device and run the Settings app. Step 2: Then, tap on your Apple ID and then select iCloud. Step 3: In the iCloud, you have to select Keychain and you will find "iCloud Keychain Switch", turn it off. Step 4: Then, you will be asked if you want to turn off Safari AutoFill, you can select "Delete from My iPhone" so that you can store it only in iCloud or you can choose "Keep on My iPhone" so that the data can be stored on your iPhone. Step 5: Finally, provide your Apple ID if you are asked for it. The Keychain Access is a built-in password manager for the MacOS, it stores all the passwords and accounts which you can retrieve if you want. The Keychain has a secure encrypted container which is known as "Keychain" where these important details are stored. It is also able to store any Credit Card numbers, Bank Account Number, PIN codes etc. If you want to disable the storage based account sign-ins then you have to deactivate the "Auto Fill" feature of Safari. Step 1: Launch Safari on your Mac and then go to the "Preferences" panel. Step 2: Now, click on the "Auto Fill" tab and turn off the following "Usernames and passwords", "Credit Cards", "Using info from my contacts" and "Other forms". This is the first step where you have to disable a few options on Safari; you can use the same procedure to deactivate the same features on Firefox and Chrome. Step 1: Open your Mac device and launch the Keychain Access app. Step 2: Click on "Login" located in the "Keychains" section. Step 3: Finally, from the file menu you have to select "Delete Keychain Login". After this, all the passwords of your accounts and other personal details will be removed completely. If you dislike using Keychain, then Tenorshare 4uKey - Password Manager is an awesome alternative to Keychain that enables you to find saved password information in iPhone and iPad, such as Wi-Fi password, mail account password, website and app login password, Apple ID and credit card information. Differ from Keychain, you can even export the password information to other famous password managers, for instance, 1Password, LastPass, Dashlane, Keeper and browser like Chrome with just one click. All you need to do is just to connect your iOS device to Mac, run this software, click on Start Scan button and wait for a while. You will soon get the password from this iOS password manager. Hopefully, the methods above will end your query on how to disable Keychain on MacBook. Keep in mind, after these procedures, you won't get any password or log-in info and other related data while using your device like before and it won't back up your info in future as well. Last but not least, if you regret to disable Keychain, you might as well try to reset Keychain password.